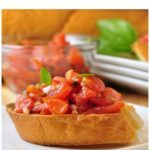 This quick classic tomato bruschetta recipe is so easy to make, you’ll wonder why you ever bought it in a jar. This Italian appetizer is garden fresh and full of flavour. 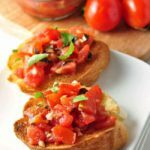 A basket of fresh tomatoes, a handful of basil leaves and a couple of cloves of garlic are all you need to make a classic tomato bruschetta. 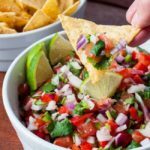 While it’s easy to pick up a jar of bruschetta at the store, why buy it when it is so easy to make at home? This traditional Italian appetizer, or antipasti, is one that everyone seems to love. My friend, Denise, is visiting her extended family in Italy and her Facebook posts have me itching to be there, savouring traditional Italian cuisine. Sweet, sun-ripened San Marzano tomatoes, crusty bread, fresh herbs, rich flavourful olive oil, tender pasta, robust sauces . . . Italians taught us the art of eating. Food is an integral part of their lives. It’s almost like a second language. It’s love. 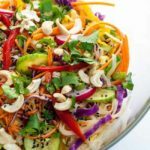 Wholesome homemade food is lovingly prepared, shared and savoured with family and friends. While the island on which I live here in the Pacific Northwest doesn’t have the romance of the Tuscan countryside, the passion of its language, or the history of its towns and villages, it has a romantic appeal of its own. I wouldn’t want to live anywhere else. Close proximity to the ocean gives us mild winters, warm summers and an extended growing season that allows us to grow and harvest our own vegetables and fruit. Just like in Italy, families and friends gather around the table to share good homemade food and local wine that’s enjoyed with lots of love and laughter. 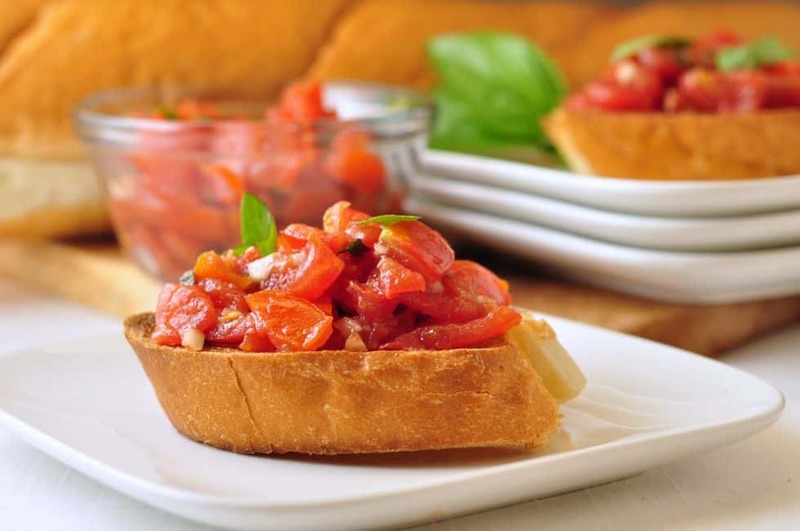 The key to the best bruschetta is the quality of its ingredients. Choose fully ripe, freshly picked tomatoes if you can. 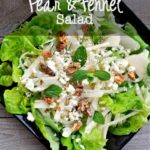 Use fresh basil leaves and a quality extra-virgin olive oil. If you choose to add balsamic vinegar, make sure to read the label and choose an aged vinegar that does not contain caramel or artificial flavours. And don’t forget a loaf of crusty bakery bread! First, seed and chop fresh tomatoes (if you use tender cherry tomatoes you won’t have to remove the skins). Next, finely mince a couple of cloves of garlic and chiffonade cut* a few basil leaves. Then toss it all with some good quality olive oil (no skimping on the amount here!) and, if you like, a little high quality balsamic vinegar. Season with salt and pepper and let stand for an hour to allow the flavours to blend. While the tomato mix is developing its flavour, brush crusty baguette slices with olive oil. Toast them on a baking sheet in the oven until they’re crispy on the outside, but still tender inside. Just before serving, scoop the tomato mixture on to slices of crusty toasted Italian bread. And finally, add a sprinkle of coarse salt and devour! 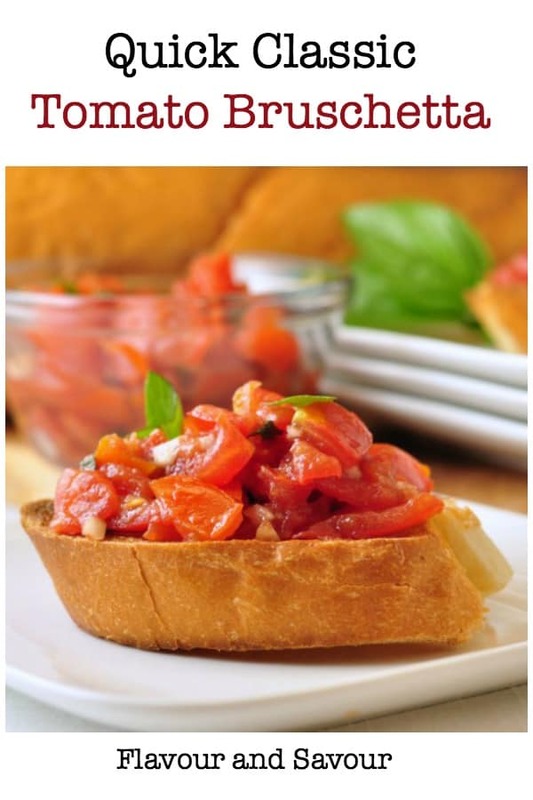 Classic tomato bruschetta is simple, it’s rustic, and it’s absolutely delicious! 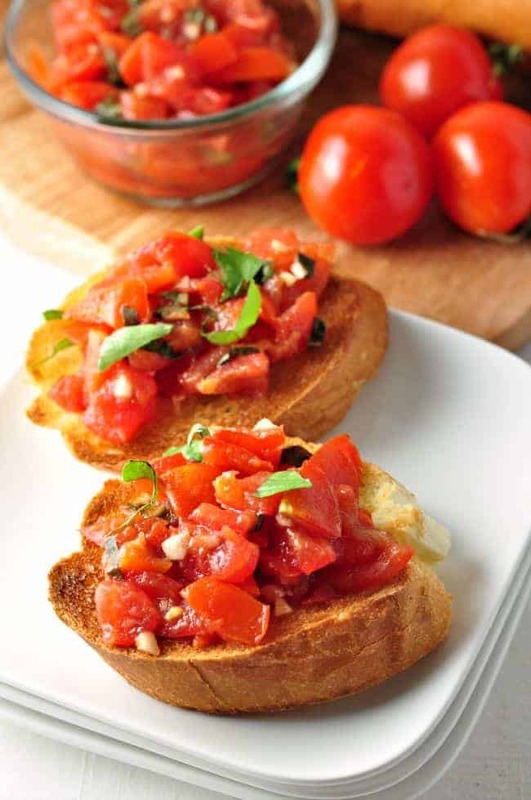 A quick and easy recipe for classic tomato bruschetta, a popular Italian appetizer. 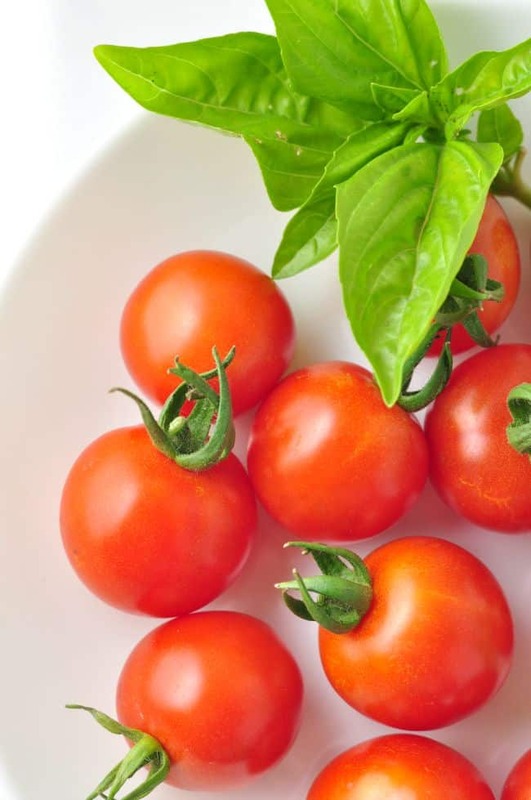 Prepare tomatoes and mix with basil, garlic, olive oil, balsamic vinegar, salt and pepper. Set aside to allow flavours to blend for an hour or more. Make the crostini. Slice the baguette in ½ inch slices. Brush both sides with a little olive oil and place on a parchment paper lined baking sheet. Bake for 10 minutes. Remove the tray from the oven, turn the slices over and bake for another 5 minutes or until just slightly crispy. The crostini should still be soft on the inside. Just before serving, top crostini slices with 2 heaping tablespoons of the bruschetta mixture. Garnish with additional basil, a sprinkle of coarse salt and a drizzle of olive oil, if desired. Serve immediately. 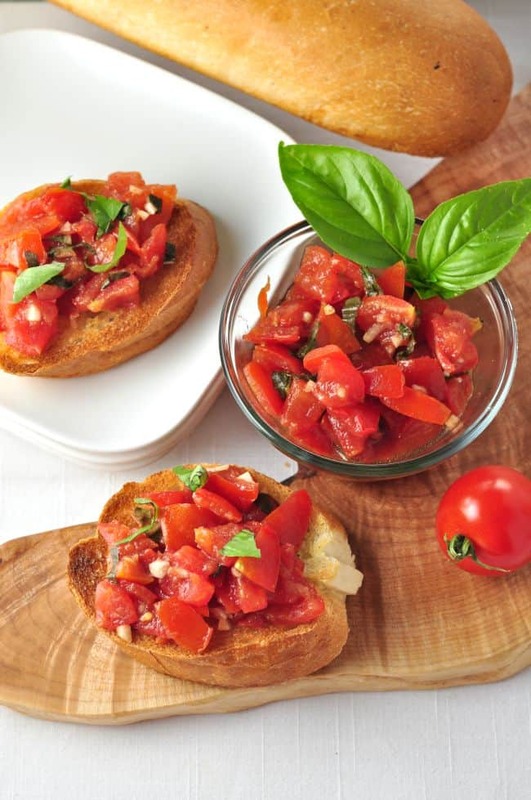 Alternatively, serve the bruschetta mix in a bowl and allow guests to make their own crostini. This option avoids possible soggy bread if the crostini sit too long. * To chiffonade basil, stack the leaves, roll them into a tube and then slice into thin ribbons. Love Italian appetizers? 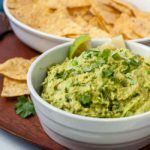 Check out my extensive list of crostini appetizers here! If you make one this recipe, be sure to snap a pic, Instagram it and tag me @flavourandsavour. I love seeing what you make!